2017 Ducati 1299 Panigale spotted | IAMABIKER - Everything Motorcycle! 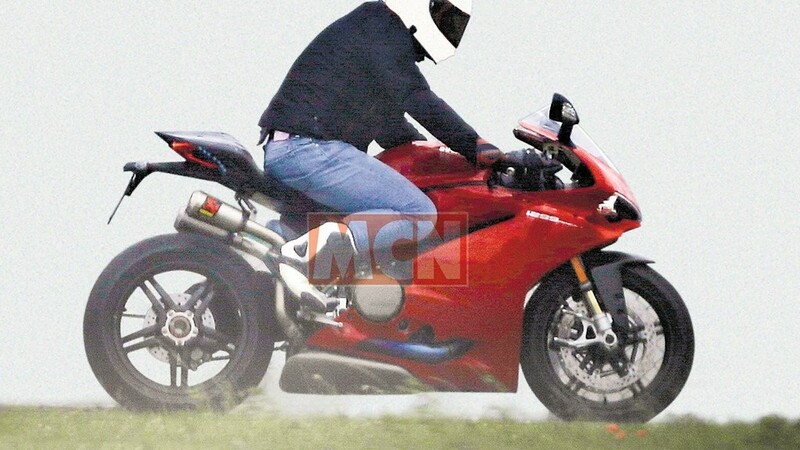 The updated 2017 Ducati 1299 Panigale has been spied testing recently. The bike that was caught testing revealed a few technical changes confirming the upcoming release. The 2017 Ducati 1299 Panigale seems to have different wheels, which are not at all similar to the wheels of any current model currently a part of the Ducati Panigale range. The prototype also had the World Superbike racing style twin exit Akrapovic titanium exhaust, which is currently available from Ducati as a £2500 accessory part. Another change that can be observed is to the fork bottom, which appears to have a differently shaped casting when compared to any current model. The casting is more similar to the version used on the ultra-exotic Ducati 1199 Superleggera launched in 2014. The Brembo monobloc calipers however are carried over from the current model. The footrests also appear to be very similar to those fitted on the Superleggera. There is also a revised cut-out in the fairing around the exhaust header aperture of the 2017 Ducati 1299 Panigale. The seat unit is also new and rather different when compared to the current bike. The profile is revised, and the taillight is much more prominently visible. There appears to be line of LED lights around the edge of the seat unit. There is a fair chance the 2017 Ducati 1299 Panigale may be one of two models Ducati announced they would release at this weekend’s World Ducati Week(WDW) festival in Italy. It is most likely that the 2017 Ducati 1299 Panigale is not an all-new bike but a tweaked 1299 that will be released for 2017 as a fully Euro 4 homologated bike. Last week, Ducati confirmed that two new models will be shown at WDW but that only one of them will be shown openly to the public. The other will be hidden inside a special viewing container, just like the original Scrambler unveiled at WDW in 2014. We still have no clear idea what the hidden bike might be, rumours indicate a modern retro sports bike that could echo the famous 900SS which will be using an engine from the current Panigale range. The other rumour is that it could be a larger displacement Scrambler, but the private viewing area indicates that the hidden bike will be a new release rather than a variant of something Ducati already manufacture. The new models will be revealed this weekend at the World Ducati Week.